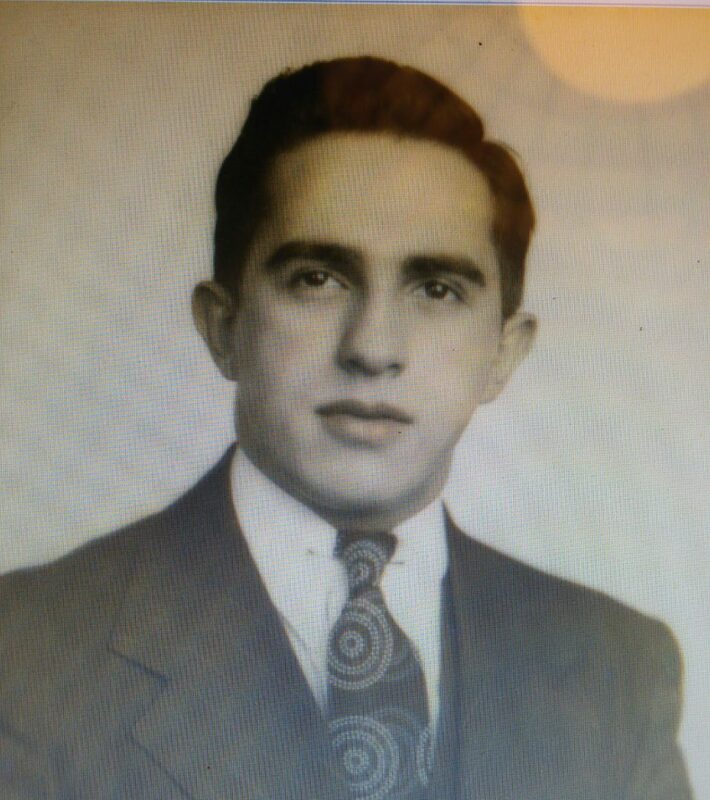 Dad at around 20–years–old (Origin of photo unknown: c. 1938–1940). In setting out to pay tribute to my father, I did not realize the amount of information and family history that I had learned from him. This post is the third in this series of honoring him. This is a lengthy post, which I hope you do not mind perusing. I also hope that you feel free to take your time reading it. As with all my blogs, I provide a lot of references and background information to help give readers a deeper context to help them understand and appreciate the significance of the issues, concepts and people I have been portraying. 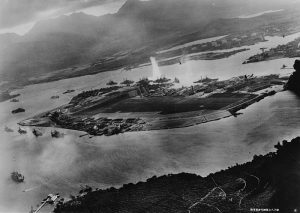 Seventy–two days after my father celebrated his 23rd birthday, the Japanese attacked Pearl Harbor on December 7, 1941. 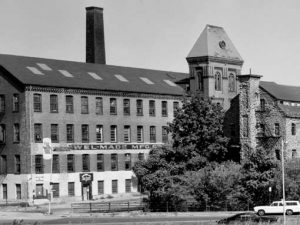 Dad was working at the former American Screw Company in Providence, Rhode Island, which was organized in 1860, a year before the American Civil War (April 12, 1861–April 9, 1865) started. The buildings are gone now and replaced by a parking lot. He worked there from 1940 through November of 1943, earning, on average of $33.00 a week. 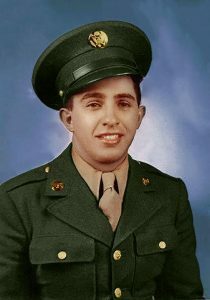 Despite his receiving three draft notices, he was not inducted into the United States Army until December of 1943 as his job was considered critical to the war effort on the home front. He could have continued working there, but he wanted to do more for the nation than work as a machinist in a factory. Dad served in the Army from 17 January 1944 until 3 April 1946, when he received an honorable discharge. He first started training in a combat engineer battalion. However, the day before his unit shipped out to the European Theater, he was transferred to another assignment where he served in Intelligence as an MP [Military Police]. He advanced in rank to a buck sergeant. American Screw Company, which was built between 1849–1873; it was destroyed by fire in 1971. [Photo from Historic American Buildings Survey / Historic American Engineering Record, 1970.] The buildings were originally located between North Main Street and Charles Street, Providence. Moshassuck Square National Register District (1970). Camp Edwards also had a large convalescent hospital housed there. 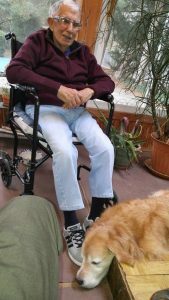 When he would share with me about his experiences at that time in his life, he often would tell me about what he saw, especially when wounded troops from overseas (European and Pacific theaters of war) arrived on the trains to Camp Edwards to be taken care of at the Convalescent Hospital. For some men, it was their first arrival stateside for medical attention. Often, they would be wrapped in battlefield dressings. The dressings and bandages were completely worn out. 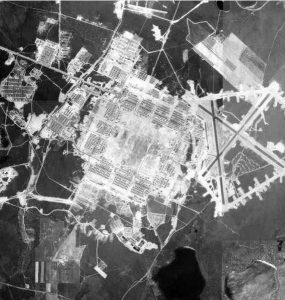 A prisoner–of–war camp was built at the camp in 1942 after the Allies’ North African Campaign started. 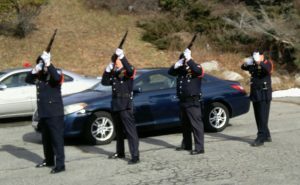 The 1114th SCU maintained security and oversaw the camp. Captured German soldiers, primarily from “The Desert Fox’s”, soldiers of Generalfeldmarschall Erwin Rommel (1891–1944) Afrika Corps, were “imprisoned” there. 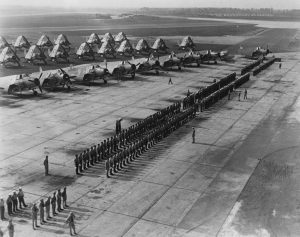 It was located at the south end of the runway and up to 2,000 POWs were quartered in the camp. Up to 5,000 POWs were received, processed and repatriated there. He was particularly upset that the German POWs had better living conditions than the American soldiers. The Germans had air conditioning and regularly heated quarters, while the GI’s had no air conditioning and had their quarters heated with wood during the cold weather. He was proud of the fact that he helped discover and break up a plot devised by German prisoners of war to put ground glass from Coca–Cola bottles in the GI’s food. I believe that his service MOS [Military Occupational Specialty code] was in the 1114th SCU DET MED Department. One of his initial missions at Otis was to investigate black market profiteering scams. It seemed that everything was game for profit. Engines, even vehicles from cars to massive tractors, simply disappeared. This matter became worse at the end of the war when the military started downsizing. 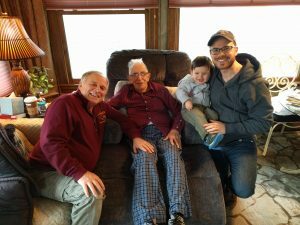 The day Dad reentered civilian life he still had his Army uniform on when he met an old farmer who knew him. He and my mom, Louise de Sousa, were seeing one another. They planned to get married and build a home in the area. The farmer asked Dad if he was interested in buying land on Vinnicum Road in Swansea. There were seven acres of property for sale. He offered to sell it to Dad for $1,000.00. Dad looked at the land and fell in love with it. It was less than three miles from the farm where he had been raised. He told the man that he was interested in the land, but he did not have the money to buy it at that time. The man said that it was okay and he would hold the land for him. Dad went to a farm equipment auction. The auctioneer knew my father. When Dad told him he was looking for a tractor and attachments, he took Dad around to look at the equipment going to be sold for that day. Dad saw a tractor and several other farm related attachments for it that he liked and would be indispensable to help him plant crops. He told Dad to get into the buying crowd when the auction went live. When the items came up for sale, he would look to him for his bid. The selling that day was brisk. The auctioneer was having a great day. My father was concerned about not being able to vie successfully for the tractor and accessories against the men so eagerly buying up all the items in the lots that were being sold. Dad was stunned from this kindness. The rest of the crowd applauded. Dad made arrangements to bring the tractor and equipment home. He had purchased a tractor that did not start, as well as a plow and a harrow that needed to be repaired and modified to fit the tractor he had just purchased. Once the equipment reached the farm on Locust Street, Dad worked on it and, soon enough, everything was fixed and looking as though it just had been built at the factory. With this restored farm equipment, he went out into the fields in the following springtime and plowed them. He planted potatoes and took care of them with great care until it was time to harvest them. He put the potatoes in 100 pound bags and sold them primarily in Fall River. He sold them to folks living in the “three–decker” homes and tenements in the city. “I even carried the bags up three flights of narrow stairs to help make the sale,” he would tell me. It took him two seasons to make enough money to pay for the land on Vinnicum Road, whose owner waited patiently for my father to pay him for the deed to it. 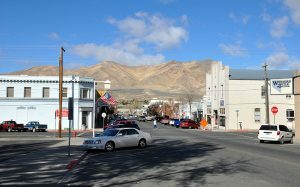 View along South Bridge Street in Winnemucca, Nevada, United States. Looking north toward Winnemucca Mountain (30 October 2009). On the Friday of November 7, 1947, my mother and father were married in Winnemucca, Nevada, which is in the north central part of the state. It is the county seat of Humboldt County. The city was named after Chief Winnemucca, I was born the following summer in the early morning hours on the 18th of August. Dad worked in a hotel in the city, eventually becoming a bell captain there. He saw some of the old cowboys come in and carouse at night at the hotel bar. Some of them became friends with him. On the night I was born, these men went around to everyone in the place and on the sidewalks outside the hotel demanding silver dollars from everyone. They filled a pair of cowboy boots completely full of them and presented the boots to my father and mother as a way of helping them pay for the cost of having and taking care of their newborn boy. My father showed great ambition. He organized getting things for people, such as cigars, cigarettes, parking spaces, and newspapers, making a fairly decent amount of money for that period of time. Lew Hutchins was a Nevada native who befriended my parents. He ran a gas station and repaired cars and trucks. Dad said that Lew was one of the best hunters and rifleman he ever saw. When Lew went hunting for elk, deer or pronghorn on the high plains, he only took one bullet with him for the day. He also made sure that the animals knew he was there and would not just sneak up on them to shoot them when they were oblivious to his presence nearby. He would get them in motion and then take aim. My father said that he never saw Lew miss a shot. He and his wife became my godparents. One of the cattlemen that Dad met offered to take me as a baby to his ranch in Montana and raise me there. He also raced thoroughbred horses. He thought that as both my parents were small in stature, I would be as well, and thus would make for a great potential jockey. I always wondered what my life would have been like if my parents had decided to send me up to the Big Sky Country . 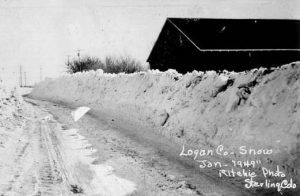 . .
An early story I remember my father telling me was about being in a car with my mom during the great blizzard of 1949. I was in the backseat of the car on the floor in a baby basket. The driving was worse than hazardous. Dad threaded his way on then State Road Route 40, which is now I-80, and went past mountains ranging between 4,000 to well over 9,000 feet in height. The snow drifted up to 50 feet in places with many areas in this part of the nation buried under more than 100 inches of snow. 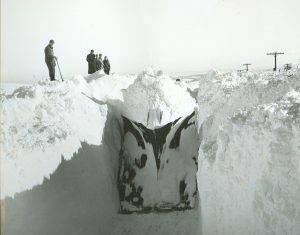 It became impossible to drive the car because of the heavy snowfall piling onto and drifting over the highway. The only thing that saved us from being lost in the storm was that a snowplow went by our car after he had to angle it off toward the side of the road on one of the high passes leading through the mountains. He was able to follow in the plow’s path until we reached the safety of a town in northern Nevada. Yet even then, the ferocity of the blizzard kept us secluded in the town for days. We left for New England in the summer of 1949. 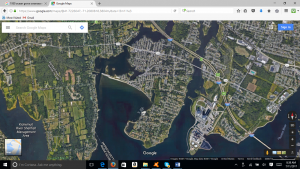 My father drove us to Swansea, Massachusetts. They lived for a while at my grandparent’s home on Locust Street. 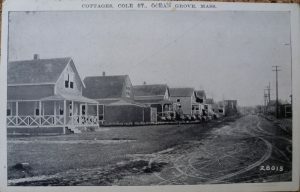 For a while, we lived in Ocean Grove, which is located in the town and on the north shore of Mount Hope Bay near the Cole River. Swansea Town Hall (Photo by T.S. Custadio, 4 September 2004). I was around four to five–years–old when we lived in “The Grove”. I do not remember it, but both my parents would sometimes recount to me about the time I wandered away from the cottage they were renting there. We had a dog named Fellah who was very devoted to me. He accompanied me on my brief and potentially dangerous journey away from home. Fellah helped me cross Wilbur Avenue (State Road 103), which was one of the busiest streets in the Grove. People saw a very little boy with his dog cross the street all alone and unaccompanied without an adult nearby to help him. The dog protected me from being hit by cars and made sure that it was safe to walk across the street. From there, I walked to the edge of a steep embankment that dropped down into the river, which was also being affected by the high tide. A strong rip current was flowing by in the brackish water. I wanted to go right to the edge of the cliff, but Fellah interposed his body between me and the precipitous drop down into the water. I was insistent about trying to look over the edge of the hill, yet the dog patiently kept stopping me from doing so. A good Samaritan saw what was happening and came to Fellah’s aid and saved me from a very nasty fall into deep water and a powerful current coursing through it. Needless to say, my mother was frantic from worry and guilt over losing sight of me being in the house, or even in the small yard around the house where we lived. She ended up following the direction I took and heard from folks that a little boy and his dog crossed Route 103 and headed off in the direction of Cole River. Eventually, she found where I was just as the woman was walking away from the cliff with me in tow. In building their new ranch style home on Vinnicum Road, Dad was helped by Mr. Travis (Travis Lumber) who gave him all the wood and supplies Dad needed to build the house. Mr. Travis knew that my father and mother did not have the money needed to pay for the cost of these supplies, but he treated it as a loan. A year after the house was built in 1954, Mr. Travis stopped by when he saw that my dad was working out in the yard of the new home. They talked together for a while and then my father went inside the house and got the money he had saved to pay the bill. He went back out to see Mr. Travis and paid him in full. This occurred at a time when people would make business arrangements simply with a handshake and in good faith between them. My father told me this story throughout his life. The last week he was alive, he told me once again how much he thought of Mr. Travis giving us all the wood that we needed to build our new home. 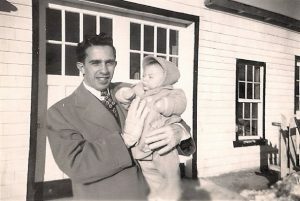 Dad holding me at my grandparents farm (c. December 1949). As a child, I was always amazed at the things my father could do. He had an amazing whistle and could do a wide variety of perfectly sounding bird calls. He could trill and warble his whistle as well, and it sounded better than Bing Crosby ever did in his recordings and performance on TV and the radio. He could mimic people’s accents with unerring precision and tell a joke with perfection. His stories were laced with whimsy, poignancy, and a refreshing sense of the joy in telling a tale from long ago or what he saw transpire that day. He could build anything and repair it, too. He was one of the hardest working people I have ever met. He also could make a sound that exactly mimicked a cat purring. I have never heard anyone else be able to do it so well. Even though I have tried to imitate him, I have never been able to make such a sound. I am not sure how he could do it, but he could tell you the outside temperature at any time of day and night and in all seasons throughout the year. For a long while I suspected it was a trick, but I took care in asking him at those times he could never have spied a thermometer. Likewise, he could tell me what the weather was bringing us, sometimes two or three days ahead of time. To this day, I do not know how he managed doing it with such accuracy, often contradicting the meteorologists’ forecasts. They would get it wrong while my father would get it right. Nelson had a steel grip, but he was a gentleman and did not squeeze my hand to the point of paralyzing me. He spent a bit more time in small talk between us and then he and my dad talked with one another for a while longer. The two men were laughing and Dad had the other people around Rockefeller smiling and chuckling as well. Those skiing trips with my father are still magical to me. I fell in love with the North country. Later on in my life, I lived in the Maine and New Hampshire mountains for many years. Dad first worked as a delivery man for my aunt Nina’s husband, Milton Beck, after returning here in the northeast from Nevada. 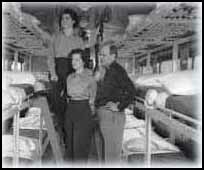 Uncle Beck started his company in 1933, which was in the midst of The Great Depression. The business he founded served professional beauty salons and barber shops. At one point in time during the 50s and 60s, it was the largest, single–floor cosmetology supply store in New England. 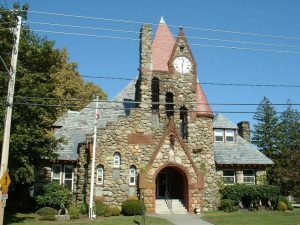 Originally, it was located on Westminster Street in Providence, Rhode Island, but Uncle Beck relocated it on the Post Road in Warwick. I started working as a stock boy at the Providence store when I was 13. The pay was a dollar an hour. Soon enough, Dad became a salesman for Uncle Beck. 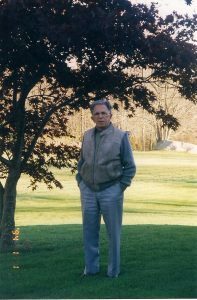 Dad carved out a sales territory that covered all of eastern Massachusetts and the islands (Martha’s Vineyard and Nantucket). He drove all over this area and racked up an average of 50,000 to 70,000 miles a year on the cars he drove. As a result of all this driving, he bought a new car every year. A 1963 Chevrolet Impala (Pinterest). I never could understand how he was able to walk into a dealership and buy a new automobile for well under the retail cost of it. I do recall being with him when he visited Mel Brodski’s (sic) Empire Chevrolet in Fall River. One day, while they talked with one another in Mel’s office, I walked throughout the showroom and looked at all the cars there just gleaming away in their pristine newness. 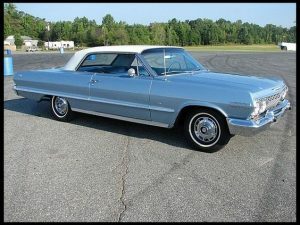 I fell in love with a 1963, sky blue Chevrolet Impala. It was an SS 283 CI with an automatic transmission and contained a powerful V8 engine. The roof was a patterned white vinyl. It was loaded with extras and the Monroney sticker on the back window of the driver’s side had a retail price of $3,263.00 listed on it. On occasion, Dad would take me with him when he was on the road. He knew a lot of people and every time and everywhere he went, they said hello to him with heartfelt sincerity and gladness. His sales acumen and knowledge of people was uncanny. He could size a person up within seconds and knew how to talk with each individual in such a way that s/he would never forget his or her encounter with him. He never received a parking ticket that stuck. He was allowed to double park his car, and the police would oversee that nothing happened to it. If he was stopped for speeding, he would either not be issued a ticket or find a way to fix it. This Teflon ability not having such tickets and fines levied against him worked even when the local and state police proclaimed that the days of such largess in forgiving tickets were over. 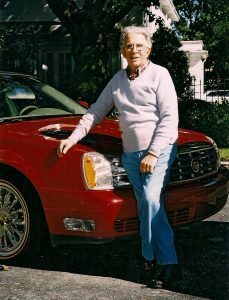 Dad with one of his beloved Cadilllacs (photo by Willetta Carreiro, Sarasota, Florida, c. January 1998). People would call my father for help whether it was a matter over a traffic ticket, a misdemeanor, or something far more serious in nature. He usually would make one phone call and have the issue resolved. Sometimes he would take me to the Statehouse on Beacon Hill in Boston and we would walk together right into the Governor’s Office and sit down and talk with him. Of the many politicians he knew, Joseph William Martin Jr. (1884–1968) was one of his favorite. “Joe” was the 44th Speaker of the United States House of Representatives (1947–1949; 1953–1955). The Speaker was a member of the House from 1925–1967. He helped arrange a tour of the White House when my parents went on a trip to Washington, D.C. in 1958. I was able to meet many well known politicians as a result of the Congressman’s recommendations. 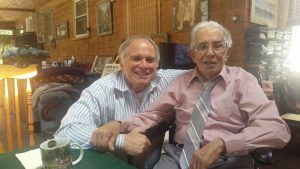 “Speaker Joe” often visited my grandparent’s home and loved to eat my grandmother’s home–cooked Portuguese food. Whenever I was around when he stopped by, I loved hearing all of the stories he would share with us about local, regional and national politics. There was always a lot of laughter, camaraderie and wonderful food shared between everyone. One of my parent’s favorite places to go was to The Eastern States Exposition. It is held every fall in West Springfield, Massachusetts. As my father loved to see the agricultural exhibits, the competitions, the Avenue of States and sample the food, we also had the opportunity to meet Dwight David Eisenhower in 1953 and Richard Nixon in 1959. Both men respectively gave me a penny, and I believe I still have them in one of my childhood boxes of special memorabilia. President Eisenhower was a force to be reckoned with and even though I was very young when I first met him then, I do not recall his being in a cocoon of secret service protection. He walked down one of the streets of The Big E, grinning and shaking hands with everyone, unrestricted in his movements in a sea of people around him. I remember seeing an almost bald man, with brilliant blue eyes lean over to me and shake my hand. “Good to meet you,” he said to me. He gave me a brand new 1953 S Wheat coin that shone like his own presence. I held onto that penny until my hand fell asleep and I put it reluctantly in my pant’s pocket. Right then and there, I became an early and ardent fan of Ike’s. When Nixon went to the Exposition, he was Eisenhower’s Vice President. My memory recalls that in April of 1958 he and his wife had returned from a goodwill trip to South America where he had not been received well in Lima, Peru and in Caracas, Venezuela. Violent student protest broke out in these two cities where he was visiting, and his limousine had been subjected to rough treatment. Bottles and rotten fruit had been thrown at it, he was cursed roundly and treated with contempt by people on the street. A pipe wielding mob of demonstrators also attacked it. He and Pat Nixon were even spat upon. As if to compensate for that, even though it was well over a year later, he was given a robust welcome in West Springfield. Americans at that time could not believe the treatment their Vice President had received. They had never witnessed any such disrespect shown to an American official at this level of high office. As he walked down one of the main streets of The Big E, the crowd roared its approval of him. My father pushed me gently into the front of the ranks of people waiting to watch Nixon go by. I was actually right in front of him when he went by where we were standing. He had a penny in his left hand and while he shook my hand vigorously with his right, he gave it to me into my left hand. Unfortunately, I do not remember what he said to me. Years later, when I was a student at the University of Maine, I received a letter from him in the 1969 fall semester. The letter is now misplaced, but I had written to him when I was the Chair of the Distinguished Lecture Series and a member of the Student Senate. I reminded him of this time when I met him as a boy at the Exposition and invited him to visit the University campus to discuss the war raging in Vietnam. He declined to go to UMO, but the letter was well written and signed by him. Since completing the last several paragraphs, I reread what I have written here about my father. I would characterize it as an idyllic portrait of him. However, my dad was a complicated human being. He had many faults. For example, he had a bad temper, he was impatient with what he perceived as foolishness in others, he was OCD and a perfectionist with everything he did, and he had a very strong penchant for privacy. He was also a very strict disciplinarian. Up until the last national election, I had no idea what political party, if any, he believed in. However, I helped him do an absentee ballot for the 2016 election. He voted up and down the Democratic ticket. When my father was mad at me, and as he was from the old school of child discipline, he would use some heavy handed corporal punishment on me. It was a terrible experience, I now believe, for the two of us. When I was a teenager, the castigation and tongue–lashing meted out to me were severe. I put as much psychological distance as I could away from him. Going to the University of Maine in late August of 1966 helped put geographical distance between us. In my 20s and 30s I hardly contacted him; and, by that time I was married and living in Maine, which was almost 200 miles away from Swansea. 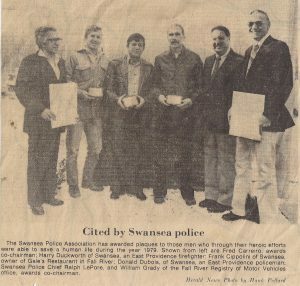 Receiving an award for saving a life as a member of the Swansea Police force (The Herald News, Fall River, 1979). For a long time, I blamed him for what I perceived were my failures and misfortune in life. Yet, as time went by and I grew older, I got over the blame game against him, and as soon as I dropped this negative weight from me, the love I originally had for him as a boy came flooding back into me. My mother and father were divorced in 1973 after being married for 25 years. It was a bitter time for them. My mother remained single and alone until she died in October of 2000. My father remarried. I played my classical guitar for Willetta and his wedding ceremony at a Baptist church in Fall River in 1975. They were married for forty–two years. 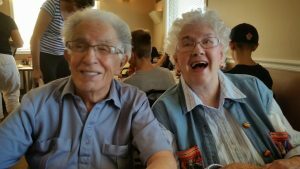 Willetta passed on in early June of 2015. I returned to this area in 2002 and moved into the home where I grew up in Swansea. At that time, Dad was 84–years–old. There was a lot of work needing to be done as my mother had not been physically able to do it because of her advancing age. She died when she was almost 77. The shrubs planted around the house were then almost 50 years old and needed to be taken down. My son Eli was helping me. The job was too much for hand tools to take care of what we needed to accomplish. Dad drove by checking up on us and discovered that we were stuck. We could not dig up and remove some of the shrubs, especially the completely overgrown Alberta spruces that were above the edge of the roof of the house and blocked anyone from seeing the sides of it. 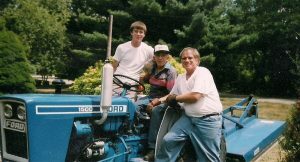 Dad drove to his home and came back about a half–hour later driving his beloved blue & white, Ford F1500 Diesel, two cylinder tractor. He had brought along with him chains and a chain saw. He handed it to me. I started it up and began cutting down the trees. Soon enough, my arms gave out on me. My son Eli, Dad and me (photo by Carolyn Carreiro, 10 August 2002). Dad took the chain saw away from me and made sure the chain was taut and had proper linkage on the bar. He sharpened the teeth with a round file that fit them properly and topped off the fuel tank. He spent the rest of the afternoon cutting down the trees and then had enough energy to pull the stumps out of the ground by wrapping the chains he had brought with him around their base and using the power of the tractor to pull them out of the ground. Until he was 94, and for almost three decades, he drove to Sarasota, Florida, with Willetta as his navigator, where they joined the snowbirds from the North and took advantage of the warm Florida sunshine. 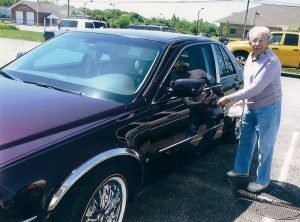 He was in his glory, in a new car and loving to be in control on the road driving in the comfort of his successive Cadillacs that he purchased well below dealer cost. On his beloved Ford 1500 tractor (photo by A. Keith Carreiro, August 2010). 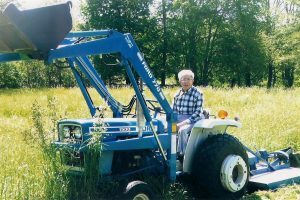 He used his Ford tractor to cut the tall grass in his field that went two–thirds around the house he had built after marrying Willetta. It was the same field he and his father, mother, brother and two sisters had worked in during the 1920s and 30s. And, it was the same field that he had plowed with horses and tended to when he was a boy. Mother Hubbard squash was grown there, as well as other crops, such as kale and tomatoes, that were harvested and taken to the Boston farmers’ market in their 2½ ton truck, which they referred to as a “deuce and a half”. In his late 80s and up to his mid–90s, he still took care of the field and made sure that it looked like a European preserve. The grass in the meadow was kept cut close to the ground, no new saplings were allowed to grow wild and all the stone walls that my grandfather had restored were kept cleared, in pristine shape and well maintained. When I visited him at his home, he would always be in the TV room, which jutted back from the main house and overlooked the field below. There were three hummingbird feeders hanging on the adjacent porch outside the north window to which the “hummies” flocked to with great abandon. Ruby-throated and Rufous hummingbirds would zip in and out with their respective ringing and buzzing noises and wings beating about 53 times a second. They are quite territorial and their twittering sounds and fast flying antics delighted him. He mostly sat in his recliner and sometimes would be eating at the little glass table nearby the chair. The nine large windows in the room allowed him an uninterrupted view of the land. He would watch the field throughout the year and observe the changes in it according to the seasons. He would share with me about the deer and the foxes that would cross the field and sometimes stay in it for hours. All of the old stories would be retold, tears would be shed about those who had passed on. I loved every second in being with him. Dad had a fourth–grade education, yet he also had a world class work ethic. He put me through college. While we were estranged for a while, I am so glad that I got over it. You only have one father on this earth; and, he needs to be honored and given your utmost love and respect. I have never known anyone who could size up someone so quickly and accurately and then sell them something they at first, didn’t want, then once buying it, bought more and became long–standing customers. He was one of the best and top selling salesman in the country in his professional field. Often, he would help train college educated people who were breaking into the area of cosmetology sales. Everyone who met with him in the “hair” business agreed he was a unique phenomenon in the industry. I had the blessing of being nearby him for the last 15 years of his life. He was a man who lived all but 17 years in the 20th century, and lived another 17 years in the 21st. Easter 2016 (photo by Carolyn Carreiro). He was part and parcel of the greatest generation of Americans. When I was older, a teenager, I could not believe how hard my father worked. A child of the late 40s and 50s, I was amazed at his strength, fortitude and work ethic, while also perplexed at his exactitude and seemingly excessive desire to be so neat. Everything had to be clean, spit and polish. Being raised the way he had been, and being the son of strict Azorean immigrants, it is not such a wonder that he turned into the exacting and beloved man that he became. The silent howitzers of time have slowly depleted the ranks of my father’s generation. Their stories and remembrances of the moments of life they experienced in anguish and victory have almost disappeared. The men and women who fought and participated in the greatest conflict of the last century are all but gone from us now. They are mostly in their eighth and ninth decades. According to U.S. Department of Veterans Affairs statistics, only 620,000 of the 16 million Americans who served in World War II were alive in 2016. 372 of them are dying every day now. Roughly four percent remain with us. If you see and/or encounter a veteran, especially of the World War Two era, please make sure you thank them for their service to our nation. If they are out and about, treat them to a meal, or just a cup of coffee and some conversation with them. After all, Our first duty to our country and to one another is one of remembrance. The last time I saw Dad before he went to the hospital I had a wonderful visit with him. When it was time to say good evening, I went over to him and gave him a traditional parting kiss and hug. When I approached the side door to go outside, I heard God tell me to go back and give him another hug and kiss.Without any hesitation, I did so. “I love you, Dad,” I said to him once more as it was getting dark outside on the evening of January 26th of this year. At the age of 98, he weighed 126 pounds and was 5 feet three inches tall. He was confronted medically with heart failure, atrial fibrillation (a quivering or irregular heartbeat—arrhythmia—that can lead to blood clots, stroke, heart failure and other heart-related complications), chronic kidney disease (stage iii, moderate), iron deficiency anemia, hematuria (blood in the urine), benign prostatic hypertrophy without lower tract symptoms (LUTS), and thalassemia (an inherited blood disorder characterized by less hemoglobin and fewer red blood cells in your body than normal). He had a pacemaker. He experienced agitation throughout the day at times, and usually became disoriented starting around sunset, which is referred to as sundowners. He also had difficulty falling and/or staying asleep. He was also battling periods of dementia. 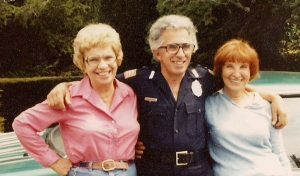 Dad and his two sisters: Rose (on his right) & Ada (c. 1976). In the early morning hours of that Friday morning, he wandered out of the house in 27 degree weather. He could barely walk with a walker and someone holding onto him with the aid of a security belt around his waist to support him being upright. We cannot figure out how he got out of his hospital bed, across the bedroom floor, down a hallway, through a living room, undo a double-locked, heavy wooden door, open it, unlock the screen door, open it go down a step, then another step, go down a walkway and then be on the edge of his asphalt driveway. He died in my arms in the ICU at Rhode Island Hospital trauma center as a result of hypothermia. He died at one o’clock sharp on January 27, 2017. It would take several novels to be able to tell about his life and times. He belongs to the ages now, as we all must eventually become. I hope that in the very brief amount of time talking about him, that I have given you a small, but accurate portrait of who he was and the essence of his character and times. — John Robert Wooden (1910-2010), American basketball player & coach. “The Women’s Army Corps (WAC) was the women’s branch of the United States Army. It was created as an auxiliary unit, the Women’s Army Auxiliary Corps (WAAC) on 15 May 1942 by Public Law 554, and converted to full status as the WAC on 1 July 1943. Its first director was Oveta Culp Hobby, a prominent society woman in Texas. The WAC was disbanded in 1978, and all units were integrated with male units” (https://en.wikipedia.org/wiki/Women%27s_Army_Corps). 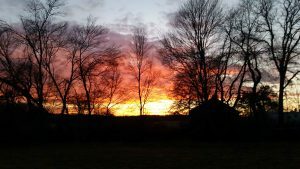 Previous post The Life of a Storyteller – Part II Next post Carla D’Aguanno: A Visual Storyteller . . .